When the vision and call of our Church Family are honored by our attitudes, actions, commitments, engagements and interpretation, they undergird a history that has extended from many generations and that will, hopefully, expand in the future generations. We determine how history will remember us by being good stewards of today. In pursuit of faithful stewardship of the long, creative, faithful history of First Baptist Church, we constantly strive to seek out and equip new and talented leadership to be a part of the work of this Church Family. We have even established a Leadership Institute to inform and equip a constantly growing pool of new leaders to participate in leadership positions. 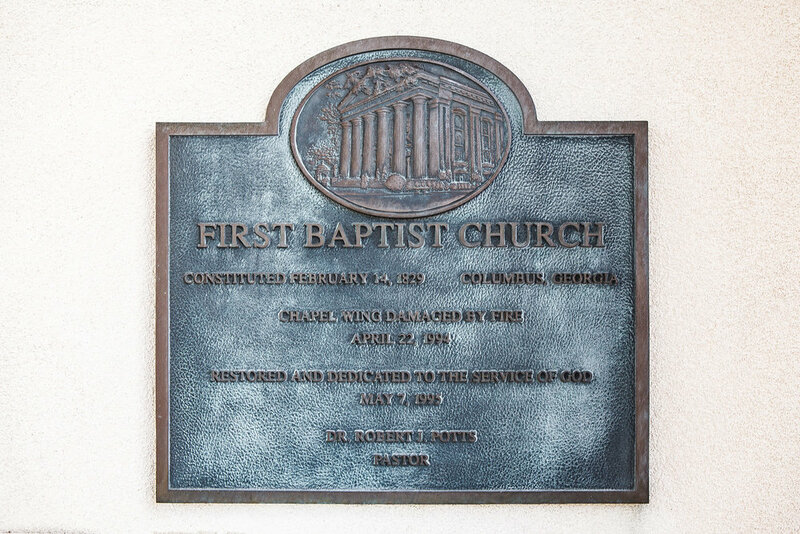 First Baptist Church, founded in 1829, has always embraced its core mission to share the love of Jesus Christ, taking it to this city and the surrounding areas. The work of this church has helped establish and more forward the work of some of the fundamental institutions in this community—the public school system, the Rotary Club of Columbus, the Columbus Campus of the Mercer University Medical School, the Pastoral Institute, Victory Mission, Second Story and numerous churches throughout the area. It has always been the mission and commitment of the members of First Baptist to reach beyond the walls of this church. The miracle of First Baptist is how it has both honored its past and dreamed of the future while relevantly embracing the present. The secret is in how the leadership and members have always determined that this congregation exists to do the work of the Lord and make a difference in the lives of others. Literally everyone in the Church Family is invited, equipped and encouraged to participate in some missions event. This is truly a place where faith is lived out in missional service. In our new history book we wrote, our people recharged in the sanctuary and went to the streets, businesses and homes to meet the needs of others . . . acceptance of this responsibility is the church’s greatest expression of its faith and heart. This section on the History of the Church ends, not with a period, but a comma . . . for there is much more to come. Come and be a part as we write the next pages of the history of ministry in this community.